Last summer, it seemed like the Dottie Angel Frock pattern was everywhere. 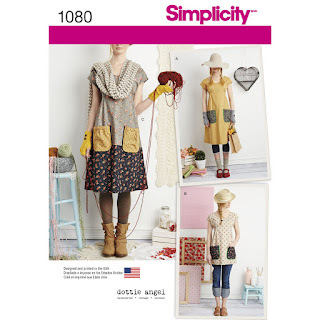 All the knitting podcasters and bloggers were suddenly sewing, and this was their go-to pattern. There were sew-alongs, tutorials, Instagram posts, a host of Dottie Angels populating the internet! So, of course, I wanted a Dottie Angel frock. I made quite a few of my own clothes in high school and college after my mother taught me to sew. She made most of my and my sister's clothes when we were kids, mainly to save money, but also because my mom is really good at sewing! In fact, she used to make clothes for Barbie in her basement sewing "room" to sell at local craft fairs to raise money for our Christmas presents. Mom even made my wedding gown in a very 1980s peach complete with puffy Princess Di sleeves. So the thought of making the Dottie Angel Frock wasn't especially daunting for me, but I just ran out of time last summer to make it. 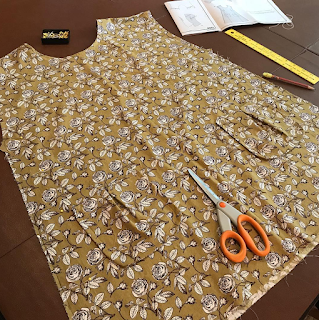 At the start of this summer vacation, I began binge watching seasons of Project Runway which prompted a real desire to "make it work" with that Dottie Angel pattern. I wasn't sure the dress version of the pattern would be particularly flattering on me, so I opted for the blouse version that hits mid hip. All the Project Runway contestants make a version of their pattern in muslin before they create a garment, so I decided I would do that too. 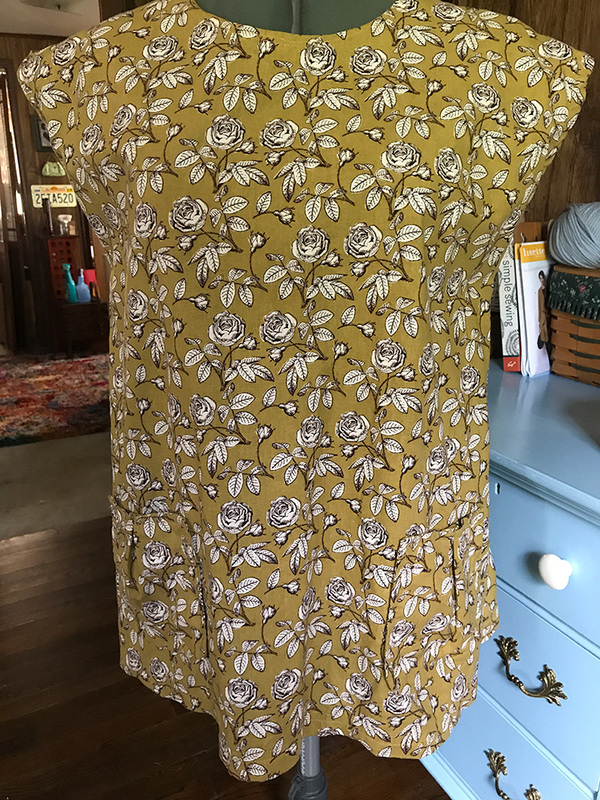 I cannot recommend this enough if you decide to make this pattern and are short (5' 1" on a good day), round (aka "mom-shaped"), and / or are over the age of 25. The first sign that I don't have a model's body came when I made the tie-backs. The placement of these ties not only hit me mid-bust but no matter what the placement, they were not the least bit flattering. I'd prefer not to look like the world's oldest pregnant lady. After ditching the tie-backs, I tried my first French seams on the sides which went very well until I tried the garment on. Too tight in the bust, huge sleeve holes, hem at my knees. Mom to the rescue! While visiting my Mom with my daughter in early July, we got into a discussion about sewing. Sarah (my daughter) asked Mom about alterations, and Mom had lots of good advice! One was to raise a garment at the shoulders if the fit in the length was off. She was so right! 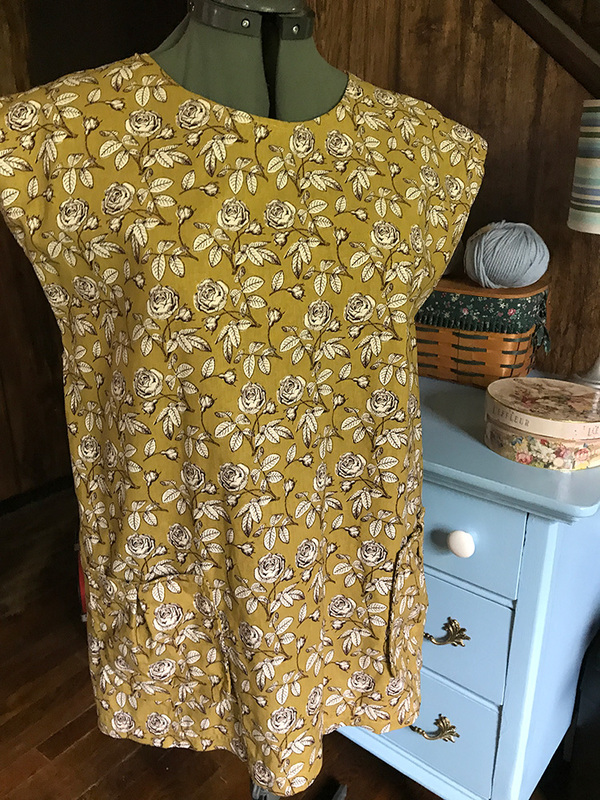 I moved my shoulder seams down approximately 2" and voila! Bust fit great and the sleeves were spot on. I also wasn't fond of the contrasting pockets, so I followed this option and made pockets of the same material as the frock (which in my case was the shirt version). After those adjustments, the pattern when pretty well although all that seam binding and basting got a bit tedious. 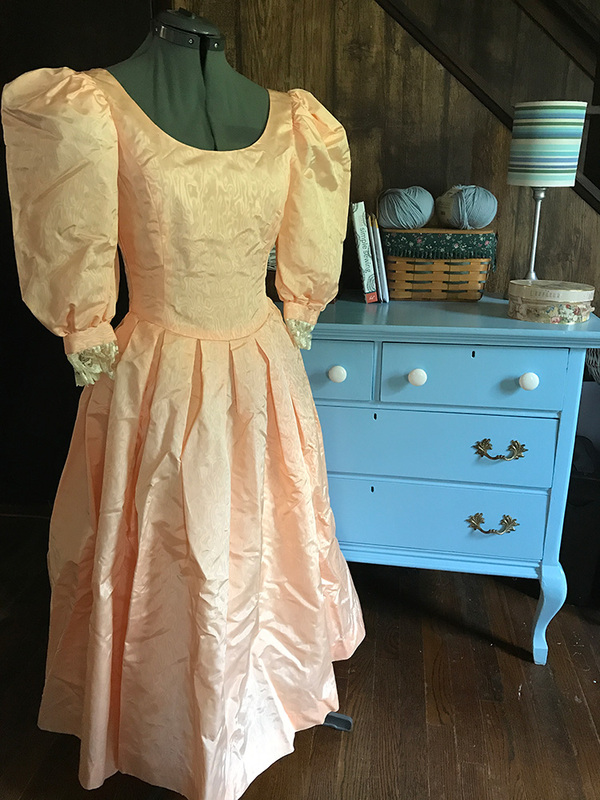 The neckline, the shoulders, and sleeves are all finished with binding tape which is very neat, and I'm sure will guarantee a longer lasting garment, but I did miss the days of sewing a straight seem and at most taking the pinking sheers to a seam to prevent unraveling! Finally the hem! So tempted to do a traditional foldover hem, but decided to stick with the pattern and use the seam binding. This took WAY too long what with basting it twice, trying to sew on the right side and not catching all of the binding, then sewing on the wrong side and still having a bit of trouble with that. The only time I had to get out my seam ripper was on that hem! 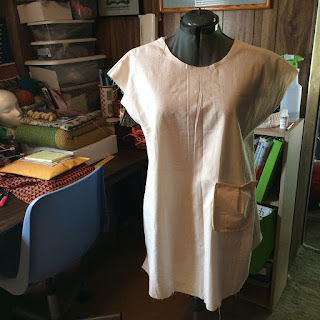 If I make another one, and I think I will in a light wool for fall, I'm making a foldover hem. What took me 3+ hours will take less than 1/2 hour with this approach, and it will most likely be neater than the hem I ended up with on this version. 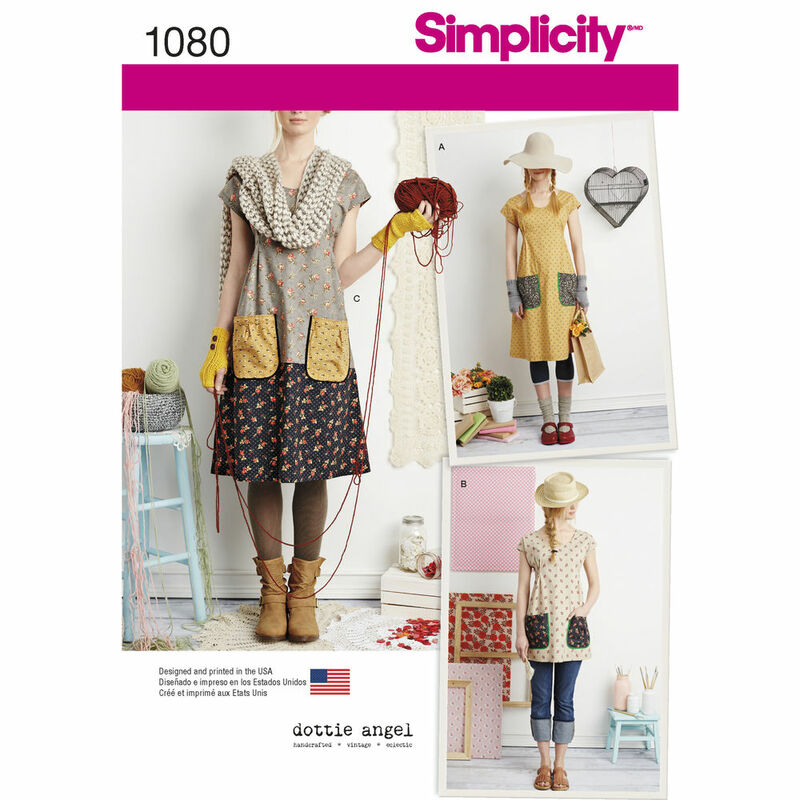 Have you made the Dottie Angel Frock? Did it work out for you as written or did you have to come up with some "hacks" as I did? Please share your experiences (and any questions and feedback) in the comments below! I made this earlier in the year, I just sewed the hem straight, having struggled to get the bias binding to sit straight on the neckline,mainly due to using a very light weight fabric. Pretty fabric, like you I didn't go for contrasting pockets either. Even though it was a lot of work, I'm glad it turned out well. I really dislike patterns that don't fit me well, so I admire your patience in following this one through. Thank you for sharing at The Really Crafty Link Party this week. Pinned! It's new to me - but it does look very pretty - I love the fabric you used. I did the muslin because I heard/read so many people having a terrible time with fit. It was so worth it! I love my version and now when I make another, it'll go quickly.